If one strong brand family can generate a lot of business for a hotel, then two families can do even better. one is pure extended stay. and a 135-room Hyatt Place. GLOBAL REPORT—Dual-branded hotels—two or more properties under the same roof or adjacent to each other and under the same management—isn’t a new phenomenon, but the concept has expanded in recent years. Innovations include splitting an existing hotel into two brands and building dual-branded properties with flags from different brand families. 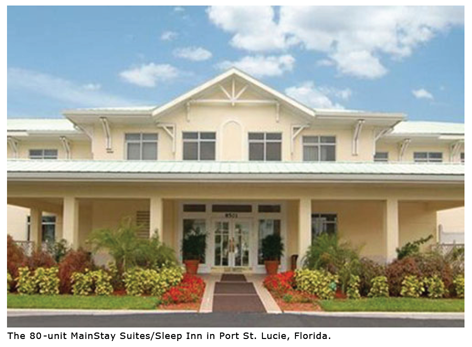 One examples of the former is a MainStay Suites in Port St. Lucie, Florida, that was reconfigured to include a Sleep Inn. The latter concept—dual-branded hotels with different brand family flag includes a development at the Sacramento, California, airport that will have a full-service Marriott Hotel and a limited-service Hyatt Place; and a Clarion Hotel in Beachwood, Ohio, that will soon undergo a renovation to convert one wing of the hotel into a 120-room Hotel Indigo, an InterContinental Hotels Group brand. Also, in Nuremberg, Germany, Foremost Hospitality broke ground on a side-byside Hampton by Hilton and a Holiday Inn Express. The MainStay Suites in Port St. Lucie was a perfect candidate to become a dual-branded hotel, said Mark Daley, president and CEO of The Generation Companies, owner of the hotel. The decision to split the hotel was a function of serendipity. During Choice’s annual convention in 2012, the company introduced a new prototype building as a combination Sleep Inn and MainStay Suites. And, by coincidence, the Port St. Lucie MainStay was originally developed (Generation bought the property five years ago) with some rooms not having full kitchens as required by MainStay. Choice created a product improvement plan for the property that required the guestrooms follow the new prototype and that the public spaces reflect Sleep Inn’s Design to Dream design package, Varner said. Daley said the renovation and conversion took about 90 days to complete. He declined say how much the project cost. Varner, too, views this as a unique opportunity for Choice, but he doesn’t rule sanctioning similar projects. That’s the philosophy Robert Sonnenblick took as he started development of a dual-hotel project at the Sacramento International Airport. Sonnenblick, who is president of Los Angeles-basedSonnenblick Development, is completing designs for a proposed 1 January groundbreaking on the project outside of baggage claim at the new $1-billion Sacramento airport terminal that opened in October 2011. Sonnenblicksaid his company won the rights to develop the hotels, but the airport wanted two separate hotels: one full service and one limited service. He said the full-service Marriott will have 200 rooms and substantial meeting space, while the 135-room Hyatt Place will have about 3,000 square feet of meeting space. Sonnenblickis currently seeking a third-party management company to operate both properties. “My task is to find a management company that is approved by Marriott for full service and also approved by Hyatt for limited service. We’ve narrowed that down to three companies, and we are negotiating with them right now,” he said. The project is being privately financed, with a 99-year ground lease from the airport authority. Sonnenblick said separate commercial banks are providing debt for each side of the hotel, and a pension fund is an equity partner in the deal. While the Sacramento project is Sonnenblick’sfirst dual-branded hotel, “I’m working on a second one right now that is a beachfront resort. It’s different in that we’re putting two major full-service hotels next to each other sharing the beachfront and sharing a golf course, but each is branded separately,” he said.